Do Popular Social Networking Applications Have A Place In The Classroom? A Growing Number Of Educators Say ‘Yes’. 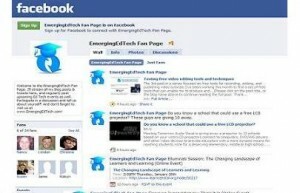 The post, “100 Ways To Teach With Twitter”, is the most consistently viewed article on EmergingEdTech.com. Similarly, “Facebook As An Instructional Technology Tool”, resulted in the 2nd most trafficked day there last year. While Facebook and Twitter are both hugely popular Internet tools, I still find myself a little surprised by the popularity of these posts, considering the academic perspective of this site. Teachers are rightfully hesitant to use such popular tools, given their inherent risk of exposing students to inappropriate content. Of course these are two very different types of tools, but they both have their place in the social networking sphere. Facebook’s place is at the top of the heap (it is presently the second most popular site on the Internet, right behind Google), while Twitter defined the genre of ‘microblogging’, but much of its use is also in a social networking context (Twitter is presently ranked by Alexa.com as the 9th most popular Internet site on the planet).